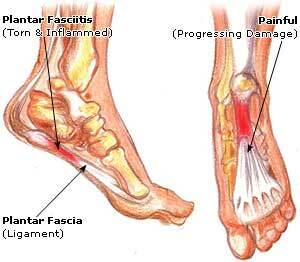 Plantar fasciitis is a painful syndrome characterized by tenderness on the bottom of the foot. The plantar fascia is a band of tissue that extends from the heel to the toes. This tissue can become inflamed and cause pain. The inflammation can occur due to trauma or secondary to another disease such as Rheumatoid Arthritis or gout. The pain of plantar fasciitis is worse in the morning after getting out of bed. Standing and walking also worsen the symptoms. The pain is also made worse by extending the toes. Other painful conditions such as bursitis and tendinitis or even Morton’s neuroma can be confused with plantar fasciitis. Initial treatment of plantar fasciitis includes non-steroidal anti-inflammatory medications and physical therapy. Injection of the plantar fascia with a solution of a local anesthetic and a steroid can also relieve the pain. Other treatments may include extracorporeal shock wave therapy and surgery.